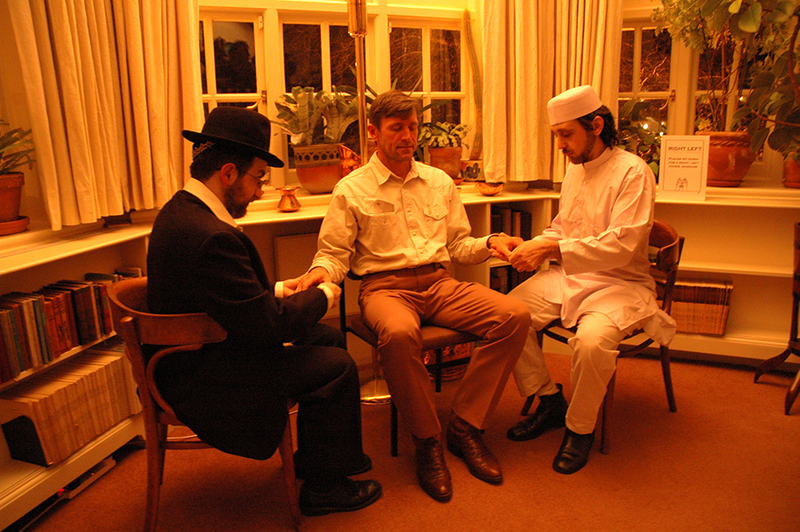 During the opening of the show Paranoia, two actors dressed as a Muslim and a Jew gave participants simultaneous hand massages. The massage routines were identical, so that what was being done to the left hand exactly mirrored what was being done to the right. At certain points during the night, the actors/masseurs exchanged places. Right, Left was performed on the large landing at Sigmund Freud’s house, as an attempt to interact with the sense of paranoia and the taboos associated with physical contact during psychoanalytical sessions. The dressed figures as ‘carers/masseurs’ challenged the presumed cultural neutrality and anonymity of the analyst, as well as the concurrent mingling of the Right and Left political positions.